YouTube seems to loved as being the great video revolution of recent (or total) internet history. The credit is certainly due when it comes to its accessibility, ease of use, community and interface features. However the quality and resolution is really lacking. It may be suitable for webcam blogging and mobile phone clips, but for anything fast moving, i.e. mountain biking videos it just blurs and all the detail is lost. In an age of 1280×1024 pixel 19″ monitors and impending HD TV of up to 1920×1080 YouTube recommends uploading video at 320×240. 16 years ago Microsoft had an operating system called Windows 3.1, its screen resolution was 4 times large than YouTube’s videos, so if you could go back 16 years, YouTube videos would still look small on your screen. For roughly a year we had a video service run by DivX called Stage6, a paradise of high quality video, where video was in 720×540, virtually DVD quality, and the only file limit was it had to be smaller than 2GB (2000MB) vs YouTube’s 100MB or 10 minutes. Unfortunately due to gross incompetence Stage6 is no more. So with nothing (that I’ve found) coming to close to Stage6 quality wise where does that leave us? Well YouTube do seem to be starting to move (and so they should be with all that Google cash floating around), they recently announced a two tear quality system. 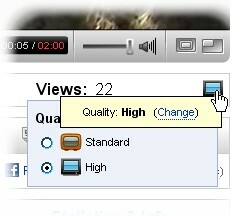 Some videos will now be available in higher quality (HQ), provided they are uploaded in HQ to start with. By default YouTube will only show the HQ version if it detects your connect speed is quite fast. But you can override this by going to your Account Video Quality Settings and choose “I have a fast connection. Always play higher quality video when it’s available.”. In the above comparison you can see the improved quality on the left and standard quality on the right. Its a lot sharper with more detail and less of the smoothed out MPEG4 effect. When it’s showing the HQ version you’ll see a little blue screen below the video, click this to switch between quality modes. So there’s some quality improvement but there’s still along way to go, I wonder how many years it will take for YouTube to get to where Stage6 was.